While the Pakistan Test team is on the rise having climbed to the top spot of the ICC Test rankings recently for the first time ever in their history, their fortunes in the limited-overs format have been contrastingly different with the 50-over format proving to be a consistent headache for the side. According to Test skipper Misbah-ul-Haq, the Pakistan Cricket Board (PCB) needs to share the blame for the same as they are not placing enough importance on the 50-over format in domestic cricket. With Pakistan currently ranked at No 9 in the ICC rankings for ODI teams, they are in real danger of having to play a qualifier tournament to play the 2019 World Cup that will see the top-eight ranked teams secure automatic qualification to the main stage of the tournament to be held i England. “While a Pakistani domestic cricketer may play at least ten to twenty first-class matches a season, he doesn't get the same match practice in the 50-over format," Misbah told ESPNcricinfo. "I have long been saying that we need to lay greater emphasis on one-day cricket in our domestic system, and play more one-day games, because you can't evolve by playing a maximum of five 50-over matches a year in the domestic circuit. Misbah doesn’t feel that there is any lack of talent coming through the ranks for Pakistan but feels that unless they garner enough experience in a particular format at the domestic level, they wouldn’t get the necessary exposure to perform at the highest level of the game. "These players are talented and they have shown glimpses of their flair, though not consistently. So this talent needs to be nurtured by giving them more games at domestic level. Exposure to a lot of competitive cricket will enable them to polish their skills," he said. While ODI skipper Azhar Ali has won only nine out of the 25 matches he has captained since taking over the captaincy from Misbah post-the 2015 World Cup, the 42-year-old feels that the players need to look at themselves before fingers are pointed at the man leading the team. Recent reports have even suggested that Ali could be sacked as skipper with Sarfraz Ahmed taking over the captaincy. "In Pakistan, there is a perception that the captain is the only one responsible for everything. Cricket is a team game and every player has to contribute," he said. "We used every possible talent in the country but it didn't work. Whenever you are forced to change, that is because team isn't performing. Unfortunately, in one-day cricket, the boys haven't performed well, like they have done in Test cricket. The bowling, after Saeed Ajmal, hasn't done enough and the batting has never been consistent." 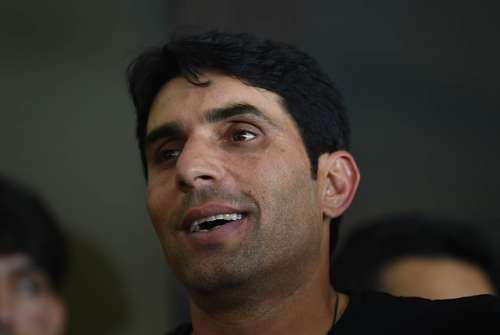 Misbah, is however, hopeful that the appointment of Mickey Arthur as their new coach will bear fruit with time as he believes that the South African has the necessary experience to bring about the changes required at the helm. "The important thing is that he (Mickey Arthur) is trying to bring a structural change from top," Misbah said. "There was connection missing in between and that is being connected. Players' fitness, bowling actions, batting techniques are being taken into consideration before selecting a squad to represent the country. Fitness is a major component and players must realise that."